The day 4-11-02 has been performed an inspection by helicopter and with the boat of the Coastguard, on Panarea and in the Lisca Bianca-Dattilo-Bottero. The 3-11-02 in this area was observed a significant increase of volcanic activity. Fishermen, in the early hours of the morning, reported, in the Lisca Bianca-Dattilo-Bottero, boiling sea, dead fish on the surface and intense smell of sulfur. The warning was confirmed by an initial inspection of the Civil Protection happened in the late morning. In Day 4, between Lisca Bianca and Lisca Nera, were visible three areas, large few hundred meters, with color of the sea greatly clearer. They had an intense lifts clear of gas bubbles. 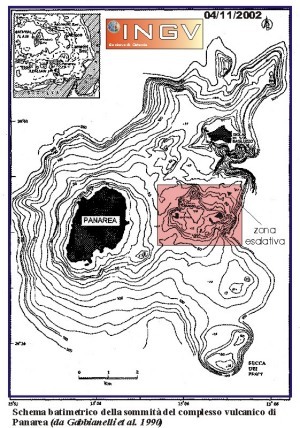 The first area was traditionally known by divers for the presence of persistent fumarolic activity. The second area, located immediately west of Bottaro, was elongated in the direction of SSE. On the surface was visible only one point where the bubble size metrics, are ascending with considerable force. The third area, covering an area significantly smaller than the previous ones, and is placed instead in the previous SW. During the inspection were made repeatedly with the thermal camera, water sampling and direct measures of temperature. The measures of temperature and thermal images indicate that there is an appreciable thermal anomaly. Temperatures water (22-23 ° C) measured near the degassing points are not significantly different from those measured at the pier of the island. The ph of water is approximately 5.6-5.7 significantly different from that of seawater. During the inspection was also visited the beach Calcara, to check any changes in fumarolic. It does not observe appreciable changes in the location of fumaroles and the temperature. The maximum temperature measured (100 ° C) did not differ significantly from those reported in the past. Finally were unfounded reports received in the day 3 about the existence of important phenomena of cracking land on the island of Panarea. The 5-11-02 we observed a significant decrease in intersted area of the phenomena and of the intensity of degassing. In particular was especially evident in the arrival area of bubbles in the immediate area west of Bottaro. The investigation thermal once again showing no significant anomalies.